Many fans of artist Connie Glowacki’s work are familiar with the story of her venture into the world of art. She had been teaching kindergarten in Janesville when in 1971 she left the position to be a full-time mom for her two children. In 1980 she was ready to return to teaching, but the school had no opening. To fill her days she took a class in watercolors and found that not only did she have talent, but that one of her paintings would win a purchase prize in a juried art show. Her success led to a career with such promise that her husband Mike left his teaching to become her business partner. After 25 years of attending art fairs throughout the country – including those in Door County – in 2008 they purchased retail space at the Top of the Hill Shops in Fish Creek and opened a gallery. Now Connie Glowacki has become a fixture in the peninsula’s art community. Last year the Hardy Gallery recognized her as an established artist and accepted two of her paintings, one an outright gift to the gallery, the other offering one-third of the sale price as a donation to the Hardy. 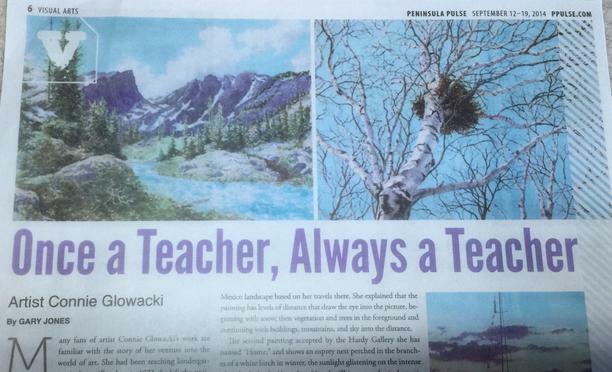 But while Glowacki has devoted herself to a career as a professional artist, she still remains a teacher at heart. 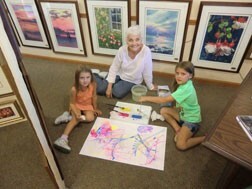 When children accompany their parents to the gallery, she will sometimes invite them to participate in an art project with her, teaching them techniques within their abilities such as string painting, blow painting, and paper roll printing – allowing children the satisfaction of creating attractive abstract art. Mike, who also enjoys children, maintains a stockpile of Beanie Babies and, with parents’ permission, sometimes offers children the choice to take one home. Adult visitors to the gallery who are artists occasionally become her students as well. When an architect stopped by recently, “I demonstrated the ebony pencil,” she said, “the different levels [of intensity] and showed him a picture that showed the levels the pencil can do,” as an alternative to using a variety of pencils for different shades. When the architect tried it, he sketched an amusing caricature of a face for her. In addition to informal lessons and critiques of other artists’ work, Glowacki offers watercolor classes for adults. She has taught both at The Clearing and at The Crossroads at Big Creek. She will return to Crossroads for a three-day session this September and a second in October. Just as she welcomed all levels of ability in her kindergarten classes, she accepts all skill levels in her watercolor classes. Typically she offers her students a group of images. The class votes on their preferred image, each student is given a photograph for a reference, and then she demonstrates techniques that students may duplicate or use as inspiration. While students work she answers questions and makes suggestions. Although she is a teacher, Glowacki continues to learn, and her subject matter expands, keeping up with her experiences. For example, the watercolor that she donated to the Hardy Gallery was a New Mexico landscape based on her travels there. She explained that the painting has levels of distance that draw the eye into the picture, beginning with snow, then vegetation and trees in the foreground and continuing with buildings, mountains, and sky into the distance. The second painting accepted by the Hardy Gallery she has named “Home,” and shows an osprey nest perched in the branches of a white birch in winter, the sunlight glistening on the intense white limbs backed by a deep blue sky. This watercolor is thematically paired with the first. During the month of August the Door County Art League hosted a show at Scandia Village’s Meadows Art Gallery. 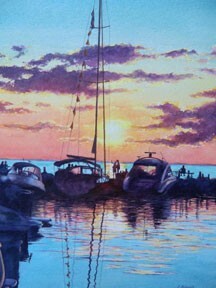 In Glowacki’s entry to the show, a tiny central figure is taking a selfie while standing on a dock at the Sister Bay Marina, boats are on either side of her as well as other people. Another nautically themed work, a Hickey Brothers fishing boat waiting for repairs, recently received a Juror’s Award at the Hardy Gallery. While Glowacki seems to have settled into Door County, she still maintains her ties with Janesville. She recently donated a decoratively painted Adirondack chair for the 25th anniversary of the Janesville Rotary Botanical Gardens. While she generally works in watercolor, for the chair she used weather-resistant acrylic paint to reproduce her most beautiful picture of the gardens, the pergola in the rose garden. Her gallery includes other views of that well-known public garden. Glowacki’s daughter helped her create a book that is a retrospect of her art career (including a statement of her philosophy as an artist), a family history, and a pastiche of mementoes. She includes studies of an old house on Cty. F in Northern Door that has been a favorite subject for more than a 30-year period, and a hunter’s cabin near Tomahawk, another that attracts her. Some images speak to her, and she can’t let them go – such as a series of photos she has taken of old barns. Her book represents a culmination of a life in art, and while it is not offered for sale, if visitors to the gallery ask, she will show it to them. But the book is not her swan song. Speaking of the Glowacki’s cooperative venture in the gallery, she said, “We’re going to go on as long as our minds and bodies allow us!